On July 20, 1993, the criminal trial resulted in the conviction of Eddie Antar and his brother Mitchell Antar. His other brother Allen Antar was acquitted of all charges. On April 12, 1995, Eddie and Mitchell Antar’s convictions were overturned on appeal. There is perhaps no more insidious drain on the overall welfare of society than greed unchecked. The saga of the Antar family and their operation of a major retail consumer electronics business is but a manifestation of that tenet. In this and related cases, it has become evident that various members of the Antar family engaged in a pattern of fraud and deceit in their attempt to enrich themselves by selling securities, the price of which had been artificially inflated through a multitude of schemes. This appears to be the last chapter in a story of a family and its deception of the public…. The Court explicitly rejected the defendants’ trial testimony that they were unaware of the frauds that were committed at the company, finding that all three defendants lacked credibility. Over that time, this court obtained a rather clear sense of him as hardworking, ambitious, and highly intelligent. I also found him to be a skillful and inveterate liar. Other family members, including Eddie Antar’s current and former wives, and non-family members settled litigation issues with the SEC and other civil litigants rather than risk trials. Various civil judgments against members of the Antar family exceed $1 billion. To date the government and various civil litigants have collected approximately $100 million from various members of the Antar family. 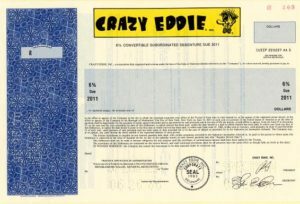 Other parties, such as Crazy Eddie’s auditors, paid about $50 million to settle lawsuits rather than risk going to trial. Over $150 million in litigation recoveries has been collected to date. It is estimated that defrauded shareholders recovered over $0.35 per dollar lost on their Crazy Eddie stock. ….the staff conducted a worldwide search for, and extensive litigation over, Eddie Antar’s assets. Even though the Commission and Crazy Eddie’s trustee brought actions in six countries…., millions of dollars remain unaccounted for. The government is still vigilant today in its efforts to collect money on behalf of defrauded victims. Rick Simpson. Tenacity, I’m telling you! When he wanted every dollar back we had to fight with him to get ten cents on the dollar on our fees. The SEC and other civil litigants actually recovered more money in the aggregate from the Antar family than profits they made by selling their Crazy Eddie stock! However, all ill-gotten gains have not been paid back. Millions of dollars were skimmed. Income taxes were never paid on undeclared cash income skimmed from the company. Sales taxes were stolen. Insurance companies were defrauded with false claims. The list goes on and on. I pleaded guilty to three felonies: Conspiracy to Commit Securities Fraud, Conspiracy to Commit Mail Fraud, and Obstruction of Justice. My plea agreement included a waiver from the federal sentencing guidelines. Therefore, Judge Nicholas H. Politan had leeway to decide either on an upward or lower departure from the range of incarceration, as suggested under the federal sentencing guidelines. The range of imprisonment suggested under the guidelines based on my sentencing report was 41 to 51 months. I was sentenced to six months of house arrest including costs of monitoring, 1,200 hours of community service, three years of probation, and $10,100 fines and fees. My criminal sentence did not limit my civil liability to other government entities and civil litigants. In my settlement with the Securities and Exchange Commission, I agreed to pay $80,000 of disgorgement for insider trading. While I had lost approximately $8,000 from selling my Crazy Eddie stock, it was determined that I cut my losses by trading on insider information. I paid only $20,000 of the $80,000 disgorgement based on inability to pay at the time of settlement. In addition, I agreed to a lifetime prohibition from employment as an officer or director of a public company. Further, I agreed to a lifetime prohibition from violating securities laws. After new management took over Crazy Eddie in November 1987, I originally stonewalled and obstructed the government’s investigation of frauds by the company. I lied to my own attorney and government investigators. I helped Eddie Antar get other co-conspirators to lie to government investigators. In early 1989, I learned that Eddie’s father and brothers set us up to take the fall for everyone’s crimes. At that point, Eddie distanced himself from me and prepared to leave the country to escape impending prosecution. In March 1989, I fired my attorneys and hired Anthony Mautone to represent me in the criminal investigation and Jonathon D. Warner to represent me in the SEC and class action investigations. Anthony Mautone contacted the US Attorney’s office in Newark in an effort to negotiate a plea bargain agreement. However, the prosecutors were very distrustful of me and would not negotiate an acceptable plea bargain agreement. In February 1990, Eddie Antar skipped town altogether rather than comply with a Court order. In a bold move, my attorney Anthony Mautone advised me to assist the government investigators and civil litigants without the benefit of any plea bargain agreement. I soon began having frequent face to face meetings with the FBI, SEC, and class action lawyers detailing the various crimes committed by the Antar clan, without the presence of my attorneys. I did not have the benefit of any legal agreement protecting me or limiting my criminal and overall civil liability. Everything I said to the government investigators and civil litigants could be used against me. I had several hundred meetings and thousands of telephone conversations with the government investigators and class action lawyers. In addition, I testified in over 50 civil depositions and disclosed my crimes without the benefit of any agreement limiting my criminal liability and overall civil liability. In August 1991, I agreed to plead guilty to two felonies. However, in October 1992, I agreed to plead guilty to an additional felony to help the US Attorney extradite Eddie Antar from Israel. The only letters sent to Judge Politan came from the US Attorney (10b -5 Letter), the Securities and Exchange Commission, the Chairman of the Shareholder’s Class Action Litigation, attorneys for the Oppenheimer-Palmieri Group (who took over Crazy Eddie in a hostile takeover and lost millions of dollars), the attorney for Elias Zinn and Entertainment Marketing (who were partners with the Oppenheimer – Palmieri Group and also lost millions of dollars), the attorneys representing the Crazy Eddie Bankruptcy Trustee, and a letter from the Trustee appointed by the Federal Court in Newark to find Antar family hidden assets. Altogether only seven letters were sent to Judge Politan (mostly from the attorneys representing investors who lost millions of dollars). They all detailed my outstanding cooperation in the Crazy Eddie investigation after I started to assist the government and civil litigants in March 1989. There were no letters sent on my behalf from any family members, friends, or my community. I did not seek any such letters from them since they were irrelevant. The federal sentencing guidelines recommended a jail sentence of 41 to 51 months for my crimes. However, Judge Politan was permitted an upward or downward departure from the federal sentencing guidelines, based on my plea agreement. My reason for cooperating with the government and civil litigants was entirely selfish. After almost nineteen years of doing Eddie Antar and his family’s bidding, I decided to think purely in terms of my own self-interest, which meant avoiding having to spend up to fifteen years in prison. My fear of serving a long prison term was the primary motivation behind my cooperation with government investigators and civil litigants. No sense of morality was involved in my decision. Any sense of morality that followed later resulted initially from the rude awaking caused by the fear of a very long prison term. Had I never gotten caught, I would not have cooperated with the government and civil litigants and I would probably still be a criminal today. At sentencing, the US Attorney noted my exceptional cooperation, but still recommended jail time for me. I believe that the recommendation for incarceration by the US Attorney was justified. Judge Politan’s sentence of six months of house arrest was both a surprise to me and extremely lenient considering the magnitude of my crimes. My cooperation with the government and others deserves no praise from them since I was only doing what was required of a felon who got caught and turned himself in – I told the truth. My sins are unforgivable. I have not paid the full cost of my crimes to my victims and society. For example, I did not pay any income taxes on the monies that I received “off the books.” My fines were minimal ($10,000). I did not pay any damages in the class action litigation and other civil litigation (except for the $20,000 I paid to the Securities and Exchange Commission in disgorgement of proceeds from my sale of Crazy Eddie stock). I never went to prison. The American Institute of Certified Public Accountants (AICPA) and the New York State Society of Certified Public Accountants terminated my membership after I pleaded guilty to certain crimes. However, it took New York State almost 15 years to begin a disciplinary action against me for professional misconduct to revoke my CPA license. I am grateful to the US Attorney, the SEC, the civil plaintiff’s attorneys and their clients, and others for recognizing my exceptional cooperation. In addition, I am thankful and indebted to the Court for taking into account my cooperation and not sending me to prison. I am thankful for their undeserved leniency. © Copyright by Sam Antar. All rights reserved.